I first found out about Trekology back in April 2013. Some of the Trek Mate family were talking about the event, what they were hoping for and that some would be attending. Of those attending was Laura Fawcett, who I became acquainted with after Destination Star Trek London, we soon became friends and something remarkable happened. I had not planned to go to Trekology but Laura had not only booked a ticket but she also entered a competition to win a ticket for the event. Laura actually won the competition and offered me the ticket. I can remember my shock at the time when the ticket was offered to me. I will always be grateful to Laura for offering me the ticket since I would go on to have a great weekend. Soon enough Bunny Summers and Matt Warwick were attending the event as well. I would be sharing with Matt (a special thanks to Matt for that) and Bunny would be sharing with Laura. While we all knew each other I had not spent much time with Laura (although we did meet previously at Collectormania) and Matt. I was looking forward to getting to know them and of course catching up with Bunny. 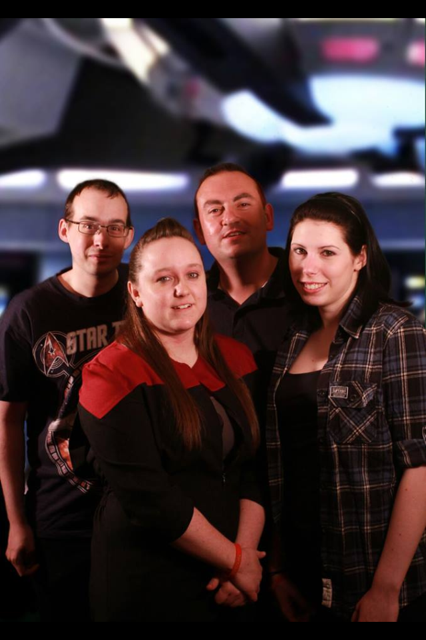 Trekology is a UK based dedicated Star Trek convention. Although it is small in comparison to other events Trekology endeavours to bring the best of both worlds with fun, interactive activities as well as star guests from the Star Trek universe. The event was run by the crew of the USS Fortitude. The ship / group was founded in 2011 and within the first two years they have run over four successful Star Trek events including “Dawn of the Federation” and this was the third Trekology event. The “face” of the Fortitude is the well known CBS “Trekologist” Raules Davies but the rest of the crew are a dedicated group of Trek fans. Trekology was being held at the Trafford Hall Hotel in Manchester. This was the third and final time the event would be held at this location. Trekology also supports the charity Help the Heroes with all monies being raised going to support our brave troops. 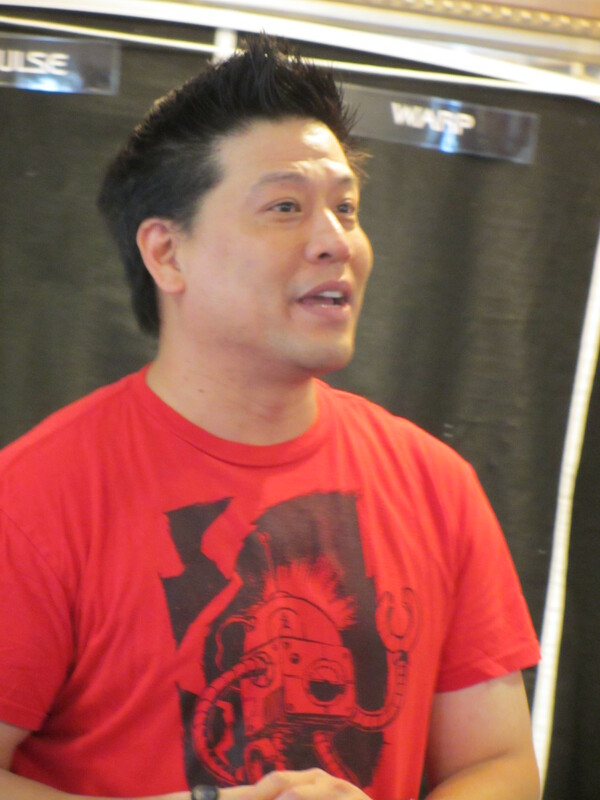 This year the show would have two guests attending; Chase Masterson (Leeta from Star Trek DS9) and Garrett Wang (Harry Kim from Star Trek Voyager). My journey began on the Friday. Travelling by coach to Manchester allowed me to ponder what my expectations were going to be for the event. My event experiences so far had only been DSTL, Collectormania and LFCC so this was going to be a new type of event for me. I really didn’t know what to expect. After DSTL I did not expect much guest interaction, I thought the guests would appear when needed and then we would not see them until their next scheduled appearance. I was hoping to meet more like minded fans; I was hoping to see some wonderful costumes and to get to meet some new friends. I expected some activities and talks but was not sure what they would be. Finally arriving in Manchester I spent some time with Bunny running around comic shops trying to find the X-Files comics and Batman / Superman number one. Imagine two people with their cases behind them trying not to knock anyone over while still trying to break the sound barrier. Already I could tell it was going to be a fun weekend. Soon we met up with Laura and after some much excitement of our tram journey where we looked liked a group of tourists we arrived at the hotel. We were met at the front door by Matt. Greetings over we decided to get something to eat, something to drink and to plan the weekend. At this point I should say that if Matt ever volunteers to direct you somewhere using his phone you should politely decline, walk away, look to the sky and direct yourself! We had some fun trying to find the local Tesco to use the cash point. As always it was right under our noses but this gave us some nice bonding time and exercise. The evening was spent admiring Bunny and Laura’s room. While Matt and I had a standard twin the ladies had three beds, a sofa and a much bigger window than us. Totally unfair! At this point it was decided that this would be base camp. We would record any video blogs here (quite ironic since the only blog we did in a room was filmed in our room) and any other things that needed to be done. It was a nice evening since we had a few laughs, played with the Dictaphone (some recordings should never be heard) and had a few drinks (mostly me to be honest). Saturday morning began with registration. We had a nice goody bag with a wrist band, a badge (or pin for our American friends) and some other bits. This was our first chance to take a look around the event, to see what would be happening and to see if we were in for a treat. To get a better look of the event I suggest you check out our video blog where Laura and I give a tour highlighting all the things to do. We had about half an hour before the opening ceremony so that gave me a chance to finally sit in the “big chair”. When the Star Trek experience came to Hyde Park in 2002 there was an exact duplicate of the Enterprise D’s bridge but we could not sit in the chair. You could not imagine how annoyed I was! Some eleven years later I sat in the chair, relaxed and felt right at home. The chair actually belonged to a member of the Fortitude and he uses the chair at home in his front room. He allowed Trekology to use the chair over the weekend. What was a really good idea was that if you wanted you picture taken in the chair you were asked to donate a pound to Help the Heroes. We wandered around the hotel, which was divided into zones. We had Ten Forward where the main talks would be heard, we had the museum where Kirk’s chair would be as well as some models, props from some of the Trek films and where autographs sessions would take place. We had the armoury which had a great display of various weapons, scanners, pads etc. There were also a wide range of uniforms on display; these were from all the various versions of Star Trek from over the years. The opening ceremony began with Raules welcoming us to the event and then introducing Chase and Garrett. They were really relaxed, took some pictures of us while Raules spoke about what was happening over the weekend. Then both Chase and Garrett spoke briefly. Chase spoke about how great it was to see everyone while Garrett spoke about his first convention in the UK where he was convinced there was a ghost at the hotel. You could tell straight away that this was going to be something different, that Chase and Garrett were going to immerse themselves into the event and to those attending. After the opening ceremony we had some time to wander round the event. We had our own map of the event which was in the middle of the programme. Again this was a well produced programme with a breakdown of the two days and what we could expect. 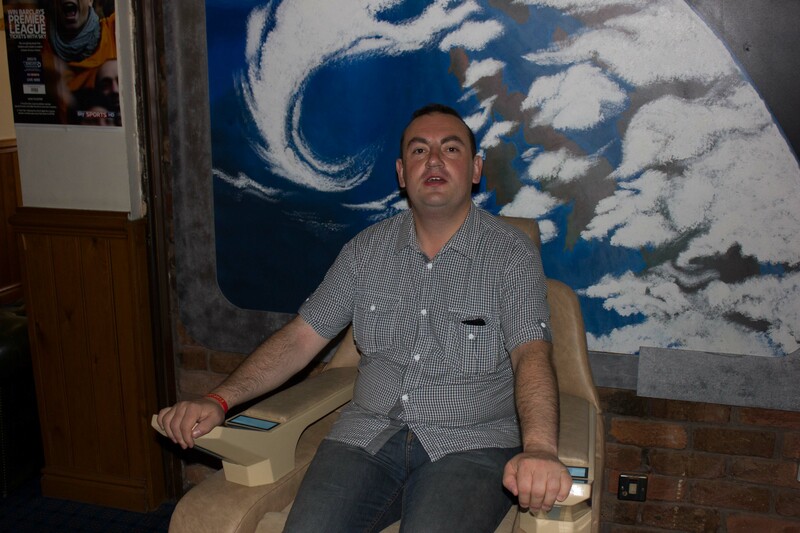 Now for those that listen to me on Ten Forward or the Holodeck you will know how often I mention how I have always wanted to sit in Picard’s chair so no prizes for guessing where I went first! Over the weekend I lost count how many times I sat in that chair but I can honestly say that each and every time I did I had the biggest grin on my face. The only thing that could have made that experience more enjoyable is if I had been wearing a uniform. The first talk would be an Academy Lecture from Will Ross who is a member of the Fortitude crew. Will was discussing star ships, warp propulsion etc. Now I have to say that I enjoy a good talk about starships but you do have to have a really keen interest in the subject. Half way through the talk however, Laura came running over to tell us that we had secured an interview with Garrett Wang! The interview would be held in the vendor’s room upstairs. There was some wonderful merchandise on display and would be a nice place to interview Garrett. Bunny had met Garret before but for the rest of us this would be our first meeting with the actor. What a wonderful chap! Garrett put us at ease very quickly; he was very open towards our questions and wanted to interact with us as much as possible. Again if you want to listen to the full interview jump over to Trek Mate but we did discuss our accents, where we came from, the difficulties working in Hollywood, attending smaller events like Trekology compared to larger conventions, what Garret took away from Voyager and his friendship with Robbie Duncan McNeill. We were given about thirty minutes to interview Garrett and the time flew by. We had so much fun recording, Garrett really is a nice guy and does the perfect George Takei and Kate Mulgrew impressions. Within minutes of ending our interview with Garret we were running downstairs to get our seats for Garrett’s talk. As you can imagine there was a full house for this, we managed to squeeze our way through to the front and sat on some tables. Garrett knows how to work a convention crowd, he spoke about his first convention, his friendship with the rest of the Voyager cast including the “boys club”, to questions from the floor and I was able to pose a question about Star Trek Into Darkness. Now Garrett’s views on the film may not please everyone but he made some valid points, he was constructive about his points. This really was a fun, insightful and interesting talk, I couldn’t imagine anyone listening and not taking something away from it. Next up was the quiz. Matt was really excited about taking part in the quiz so we all jumped in! As Worf would say “Death to the opposition”. We didn’t win but it was fun with some really hard questions, we thought we knew Trek! The knowledge the room was astounding. In between the quiz, the talks we were able to speak to some of those attending the event. We were asking about their time at Trekology, have they been before, what did they expect etc. It was really nice to talk to everyone, to gauge their interest in the event. Everything was positive. Matt and Bunny took some really great pictures over the weekend. After sitting in Picard’s chair I thought I had peaked but then I decided to sit in Kirk’s chair! Oh my word, that is an amazing chair. It felt so good sitting in that chair, the level of detail was amazing and from the pictures you could see the red bridge rail around the chair. I think I was more fascinated with the rail than the chair. I think from my point of view after seeing so many hours of Star Trek to be actually able to sit down where some of my favourite characters have sat really was incredible. The guys were really great indulging me with my “geeky” moments; I think some of my reactions must have been priceless. After the opening ceremony, Garrett’s interview and talk we were already using the word “intimate” to describe the event. We all agreed early on that this was going to be a very special weekend and not only from us but from most of those attending there really was a feel good factor around the hotel. Chases talk would be just as “intimate” but for me very emotive. While we had the normal Star Trek questions around Leeta, DS9; Chase told us some really interesting stories about her first days on set, meeting Avery Brooks and working with such a wonderful cast of actors. Chase also told us about her work with “Big Finish” audio and Doctor Who. Chase has been lucky enough to work with the likes of Tom Baker, Sylvester McCoy and now has her own series of audio stories as Vienna, a bounty hunter. I was lucky enough to ask Chase a question. I asked Chase about her work on the Anti Bullying Coalition. Chase told us how the coalition came about, her own experiences being bullied and the wonderful work they are doing not only to prevent bullying but to support those who have been bullied. For those who know me you will be aware that I was bullied as a child, some things you never forget and as Chase was talking I could not help but look back at my own experiences and wished that I had something like the Coalition when growing up. I could feel myself welling up during the talk but managed to hold it together. I really like Chase but after the talk my respect and admiration for her grew and I knew that I wanted to help spread the word. The evening began with Misty Chance; a drag artist who we all first met at Star Trek London. Misty wears some amazing Star Trek costumes including Seven of Nine’s. 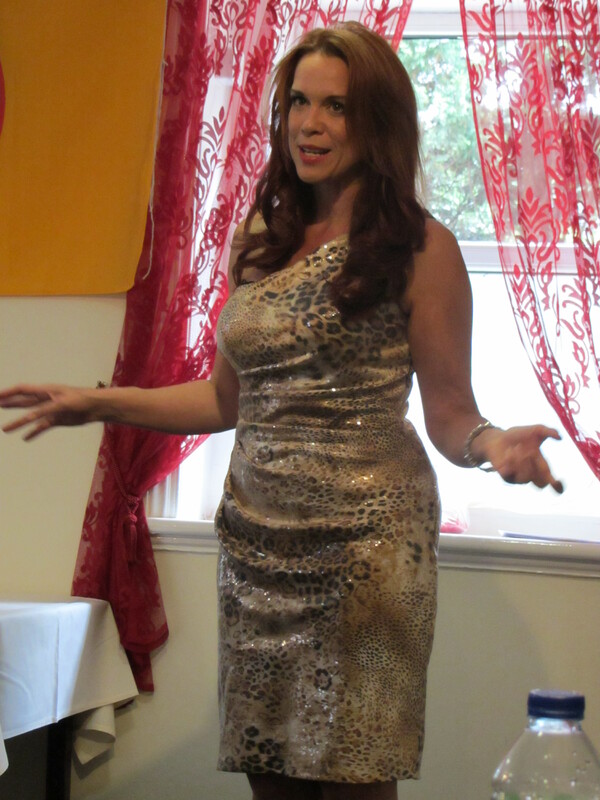 Misty wowed us with her act; it was hilarious and knows how to work a crowd. The audience really enjoyed the show and to end the act Misty was joined by Chase who sang together. Chase then went on to sing a few numbers and these were brilliant, Chase is a wonderful singer and we were all captivated by her. I know Laura was moved and had a wonderful hug from Chase. We were lucky enough to spend some time with Chase straight after her set. Chase actually remembered Trek Mate from a previous event and we spoke about her work with the Anti Bullying Coalition and Trekology. Chase was looking forward to our interview the next day with her. While we were talking the disco was in full swing, then to my shock (but not to my surprise) “Star Trekkin” came on and the place went wild! Now before that evening I did not know there was actually a dance to go with the song and if you could have seen my face when it started you would have been in stitches. Chase then took to the floor, grabbed Bunny, Laura and I (Matt was wise & stood well away) and off we went. What a crazy dance, we then also danced to Doctor Who Joe 90 and many more. Everyone was having great fun, I have to say this was most probably the best evening I had had in months. Sharing the evening with Matt, Laura and Bunny was very special and won’t be forgotten. Garrett too was at the event, he partied well into the night. He performed with some glow sticks to everyone’s delight. Again this just highlighted how much fun Trekology was, how the actors could relax too and get to mingle amongst the guests. It really was a special evening. Now I would be in remiss if I didn’t mention how wonderful both Bunny and Laura looked on the Saturday night. 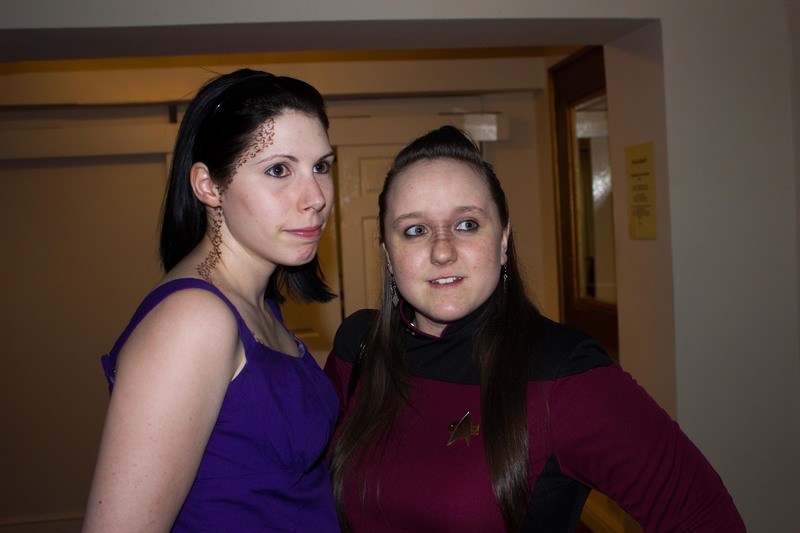 Bunny was wearing her Trill dress along with some very accurate spots and Laura was in a Starfleet uniform top / skirt. Matt and I felt underdressed all evening. Sunday was a much slower day for us. The event itself was pretty much laid out the same as the Saturday. Garrett and Chase’s talks were at different times but that was it. We spent the morning interviewing some of the attendees and those from the U.S.S Fortitude who had made the event possible. We were also able to speak to Raules Davies who was the brains behind the event and of course the CBS Trekologist. We recorded a tour around the event which was a lot of fun. I am not normally comfortable in front of the screen due to a lack of confidence but once I started it went quite smoothly. We attended Chase’s second talk in the morning. Chase again thrilled us with tales from DS9, about Big Finish and all the other projects Chase is currently involved. It was great that Chase mentioned her talk from the Saturday but most of the content was new which for those who attended the previous day appreciated. Most of the morning was quite lazy, we did not attend the academy talks or quiz but instead spent time talking to people, discussing the day before. The day was slightly overrunning so Garrett decided to hang with us in the bar. It was quite surreal having Garrett sit with us on the large sofa talking with us like one of the guys (which he is). We also managed to have a picture of the four of us in front of the green screen. We chose as our background the bridge of Voyager and I have to say it’s a really nice picture. The time to leave was fast approaching. We would have time to see some of Garrett’s second talk but would need to make a discreet (or so we thought) exit. The only downside was that we were not able to find time to record an interview with Chase. Garrett’s talk was again really enjoyable; he was taking about the night before, his experiences on Voyager and upcoming projects. Half way through the talk we had to leave. We quietly got up but Garrett noticed us and actually stopped what he was talking about, said goodbye to us, mentioned how great it was to meet us and actually invited the audience to say their goodbyes. It really was a nice moment but did take us by surprise. We then caught up with Chase who was nearby; we explained that we had to leave since we had coaches to catch and places to go. Chase was visibly upset that we were going which was very moving. Chase was upset that we did not get a chance to record an interview but has asked us to contact her to set something up on Skype. We did have enough time to ask for a group picture with Chase, we chose the original series bridge set and after some careful planning from Bunny we had the perfect picture. It really was difficult to leave that Sunday afternoon. We were going to miss the closing ceremony, the Sunday night disco and much more. Hindsight is a wonderful thing and we should have made a whole weekend of the event. We won’t make that mistake again! What was equally hard for me was saying goodbye to Bunny, Laura and Matt. Over the weekend we really became good friends; we got to know each other quite well and can’t wait to do this all over again. Bring on the SF Ball next February. Within the next few days I began to edit all the material we had recorded from the weekend and it was not until six podcasts later that I actually began to feel the post con blues. Listening to all the material we had recorded I was able to relive the weekend but when it was all done and dusted I felt very sad that it was all over. Trekology was an amazing weekend; we met and got to know Chase and Garrett. We met some wonderful Star Trek fans (some of whom I have kept in touch with) and managed to produce some really good material for Ten Forward. However, if asked what was the main highlight for me over the weekend I would have to say it was spending the weekend with Bunny, Laura and Matt. When I began writing my blog I was concerned that I would not be able to write enough to keep the readers interested. What on earth would I write about? Would it be a journal of my daily life, would it be about my podcasting or just a place to share some thoughts about what’s going on in the world? Over the past eight months or so I have shared pretty much a varied choice of topics and I do hope you have enjoyed reading them as much as I have enjoyed writing them? The idea of this blog came from my good friend Dave (my former co-host of the Holodeck) and to this day I really appreciate the encouragement and support he given me. I also have to thank Bunny for helping me to improve my writing. Bunny has shown me a lot in the past few months and I think you can really see the difference in my writing. This posting is all about new beginnings. I wanted to share some of what has been happening to me the past few months and about the new beginnings that have come my way. Three months ago Becky and I separated. After seven years of marriage and fourteen years of being together we have decided to part ways. One night at the end of May my whole life changed, everything I knew to be secure, everything I knew to be a given changed forever. I moved back to London to live with my family and began the process of rebuilding my life. As you can imagine this has been a difficult time for me and while I am writing about it now I don’t plan to mention it again. Before I speak of new beginnings I need to thank some people. Within twenty minutes of these world shattering events there was one person who stood by me as I cried, screamed, threw tantrums and much more. That person was Sina. Sina is truly wonderful and words will never be enough to express what you mean to me and the support you have given me. I also have to thank Jon and Theresa. 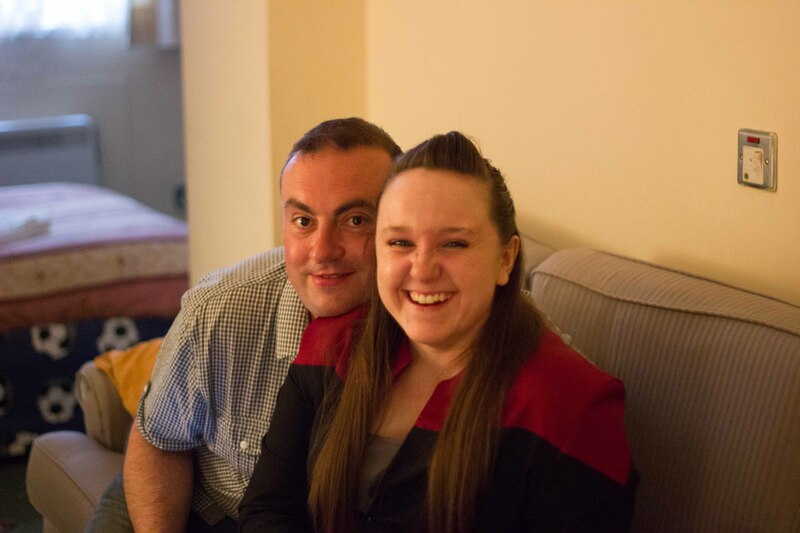 When I moved back to London I started staying at my sisters house and within a few weeks my nephew Jon and his girlfriend Theresa and I really became fast friends. We really bonded and spend so much time together. Like Sina they have really seen the best and worst of me over the past three months. I couldn’t imagine things without them now. One of the friendships that has really grown these past few month and one I am really proud of is that of myself and Bunny. I really do enjoy talking to Bunny, we have a lot in common but also we have a lot of differences. Bunny too has had to listen to me in the early hours of the morning trying to understand what has been happening and where do I go from here… Some people “don’t get” Bunny but I all I can is that you are really missing out on an extraordinary person. Thanks Bunny, the next Bacardi is on me! Finally thanks to Laura, Matt, Dave,Wendy and everyone else who has supported me over these past few months. You are all wonderful. So new beginnings. I am living in Radlett in Hertfordshire. I also stay at my mums sometimes in Finchley which is nice. I have started a new job for a retail company called Amy’s. They have three shops (so far) that specialise in Kitchen equipment and general household items. They have some good plans for the future and after two weeks I am starting to settle in. It has been difficult getting back into the swing of things with a full time job, less time for podcasting, editing etc but for me to rebuild I needed a job. It all starts here for me. I want to learn to drive again, I want to visit as many conventions as I can over the coming months, years and most of all I want to get to know Michael again. Who am I, what do I want in life and as President Bartlet would say “what’s next” for me…. Star Trek: The Next Generation – All Good Things…..
After seven years of exploring the final frontier it was time for this incredible series to come to an end. The Next Generation was moving to the big screen but before that there was time for one last adventure…. The episode begins with Worf and Deanna returning from a nice walk on the Holodeck (I am not even going to comment about the awful decision to put these two together)when they are confronted by Captain Picard who is quite disorientated but tells the pair that he is travelling back and forth through time. The story takes place during three time periods, the past, present and future. During the past we get to see the first hours of Picard assuming command of the Enterprise with welcome returns of Tasha Yar, Chief O’Brien and the way they all looked in “Encounter at Farpoint” (always good to see Troi in boots and a skirt). The future is set 25 years after Picard commanded the Enterprise. Picard is now retired and is working on his vineyard. Geordi is a famous author, while Data teaches at Cambridge University, Riker is now an Admiral in command of the Enterprise, Worf is a Klingon governor, and Dr. Crusher is in command of a medical vessel while Troi has passed away. The overall arc of the story is that Picard in one way or another will cause the destruction of the earth and Humanity. We see Q return in a much darker way than before whom again puts Picard on trial for the “crimes of humanity” and we discover the trial never ended. However, with Q’s assistance Picard is able to travel through these time zones trying to discover how he causes humanities destruction? Through these experiences Picard is able to discover that he did cause the destruction of humanity by actually investigating the very thing he was trying to avoid with a very clever paradox. Of course with help from all the Enterprises from each of the three time zones Picard is able to avoid the destruction and sets a new timeline in motion so that events will be somewhat different to those he encountered. This was a very cleverly written story by Ronald D. Moore and Brannon Braga. Not only do we have closure for the series we also get to see the story return to where it all began seven years ago. It was a nice return to the beginning and for me I enjoyed this time period / story arc the most while watching the episode. I thought it was wonderful to actually see Picard take command of the Enterprise, something that we didn’t see in “Encounter at Farpoint”. We saw Picard meet Data for the first time, something that I had always wanted to see. The sense of nostalgia Picard has when he sees Data in engineering is touching since Picard knows how much Data means to him and how their relationship develops over the seven years. It was great to have Tasha in the story too. I have to wonder how Denise Crosby must have felt recording the series finale, knowing that she missed out on so much. When I first saw this it was on a special edition video which had extra scenes that the standard video did not have. On the special edition we also saw an interesting scene where Troi explains to Picard that she and Riker had had a previous relationship which again for me fills in some of the blanks from “Encounter at Farpoint”. The production team spent so much time and love restoring some of the sets that were used in the early seasons including the bridge set, the conference lounge with the gold ships on display, the spandex costumes. This made the episode not only a great story but also a nice reminder of where the series started and how far it had come over the seven years. The future also looked great. We saw the Enterprise with three warp nacelles and some incredible phaser weapons. We saw again some different future uniforms, Data with a touch of grey which worked perfectly for his character and Geordi without the Visor. Something that we would finally see in “First Contact”. I have a feeling that for the production crew it was far harder to go back and restore the earlier Enterprise than create the future version. For the characters we find that the future has not been good to them and as the years have gone by the crew have drifted apart with some hating each other. Having Picard marry Crusher was interesting and to have them actually divorce was a surprise. It was almost like let’s give the fans what they want but then we will twist the knife and show that it never lasted and take it all away. The Riker / Worf conflict did nothing for me since I did not believe in the premise that Deanna would begin a relationship with Worf. Something that would not be continued in the film series that would begin after the series finale ended. What I did find baffling was that during the whole period of 25 years Data seemed to have made no progress whatsoever towards his goal of achieving emotions and becoming more human apart from using contractions. He seemed exactly as he did in the present except now he was teaching. No doubt this was due to what we would see in “Generations” but something could have been done with the character to further develop the character. During the present there are a couple of scenes that stood out for me. The first was the scene between Beverly and Jean-Luc in his ready room when the pressure of what is happening starts to overcome Picard. I loved this scene, for some reason Beverly (Gates McFadden) looks even more stunning than normal and the kiss between the two was so endearing and something that should have been carried over to the films. It was almost like a perfect moment as described in “Insurrection”. The second was when Picard realises that the subspace anomaly was converging in three separate time periods and that one moment of clarity shows the Q that there is hope for humanity. It’s so well played by Sir Patrick Stewart. Considering that the finale was being made while the filming had begun on Generations was astounding. The pressure on the writers, crew and the actors must have been incredible but they still managed to create an amazing finale. There was some tension during the filming and it was reported that Sir Patrick Stewart had to call a meeting to discuss the concerns of the actors over the story and that some of the character moments were being removed. What I also found interesting was that there was going to be a fourth time line where Picard and crew were going to steal the Enterprise from a museum. This sounded too much like what had happened in Star Trek III but due to time this element of the story was removed. “All Good Things…” is regarded as one of the best episodes of TNG by fans. It is regarded as one of the ten most essential episodes of TNG and Star Trek supremo Rick Berman considered this to be the favourite ending of each of the incarnations. The story has been adapted into a novel as well as a comic. Two characters I wanted to leave to the end were Captain Picard and Q. As mentioned I found Q to be much darker than he had been in his last appearances on the show. As Picard said there was more of a “deadly earnest” to Q and John De Lancie played this perfectly. Q knew how serious the stakes were and was doing all he could to help Picard find the answers that he needed but there was no confusion that if Picard failed Q would not have saved humanity. The whole relationship between Q and Picard goes full circle in this story and you cannot help but feel that Q now not only believes that there is more to humanity than he first thought but more important that he now sees Picard as an equal (excluding all the omnipotent powers). The scenes in each of the time zones between the two were wonderfully played and made this in to such a special story. Captain Picard goes on an amazing adventure during this story. It’s almost like “A Wonderful Life” with Picard able to see the past and realise how much his crew means to him, to see where it all began and more importantly how they have all grown together over the years and are more like a family now than just a Starfleet crew. You can see his concern over the future where the crew have drifted apart, the end of his marriage, the friction between Riker and Worf, the death of Troi which leads him to tell the crew what happens in the future in the hope that they can avoid this happening. While in the present you see Picard under increasing pressure, not having any answers and the emotional impact of seeing Tasha, knowing how the future has changed everyone he cares about brings some wonderful acting from Sir Patrick Stewart. “All Good Things…” shows us a Picard who is now comfortable with his place in life as Captain of the Enterprise but also that being in command does not have to be so lonely. This comes across perfectly in the final scene at the poker game where Picard finally joins the crew for a game and as he looks around the table at his crew, at his friends he knows he should have done that a long time ago. This was a fabulous scene, most probably my favourite scene from the series and Star Trek in general.